I am sorry to see another monstrous carbuncle blotting our rural landscape. I refer to the Barwood Homes site on the Banbury Road close to the traffic lights. I was stunned when the developers of the Milton Road houses called the site “Adderbury Fields” as if determined to rub in to residents their theft of more green fields but I am learning that developers have no public sensitivity when Barwood Homes can describe their development as “Meadow View”. Their site and, particularly, the block of flats that is looming out of the highest part of it is blocking the delightful view of meadow land that residents on the Banbury Road opposite had enjoyed for many years. In any case, we already have a Meadow View in Adderbury so their nomenclature is potentially confusing and wrong. We should not blame Cherwell planners for this carbuncle. They refused the application but it was granted by an inspector on appeal. Why the developers chose to build a block of flats on the highest and most visible part of the site baffles me. The people living in the houses on the other side of the road must be furious. I certainly would be. This is one of a line of monstrous carbuncles. I regret permission was given for the Gracewell home in its position close to the old Greenhill House site. 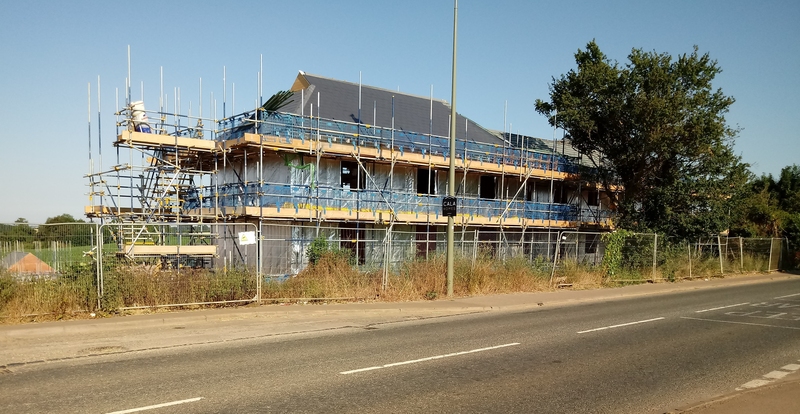 Coming into Adderbury from Banbury, we see these large, urban-style blocks of brickwork, first the Gracewell Home, then the flats built where the Leonard Cheshire Home used to be and now, this block of flats poking out of what used to be fine meadow land. It is just too sad and Cherwell is to blame for the Gracewell and Greenhill developments. On the other side of the village, on the north of the Milton Road, we have Clockmakers’ Turn built almost all in red brick, contrary to the strong recommendation of Adderbury Parish Council and another blot inflicted by Cherwell planners. Coming into the village from the Milton Road, we see an urban-style estate that spoils the initial impression of our fine old ironstone village. At the other end of the Milton Road, the development on the north side has the same effect of urbanisation for Bloxham and was contrary to the wishes of the Bloxham Parish Council. Planners, local and national, have a lot to answer for. This entry was posted in Local and tagged Adderbury, Barwood Homes, blot on the landscape. Bookmark the permalink.